The costs associated with recruiting, onboarding and training a new employee are very high. This is why it is important to keep quality employees engaged and satisfied. This means that managers must receive training and continuing education regarding employee management to keep staff fully engaged and satisfied. Even a company with competitive salaries, great benefits and rewarding work will not be able to retain staff if the managers are unable to properly supervise, develop and motivate their staff. Management training can be very useful in teaching managers how to maintain a satisfied workforce, but it is important to remember that there is no one size fits all solution. This is why managers should have a wide range of tools and skills available to deal with their employees. A talented manager will do more to retain talented staff than a pay raise or extra week off could. There are many different facets of most management training programs, but some that are most relevant to employee retention are effective communication, delegation, conflict resolution and coaching. Once a manager is trained in these skills, not only will they benefit, but their staff will also benefit. The staff will often be happier when working under a more-skilled manager and they will also experience a trickle-down effect of the knowledge gained by the manager through on-the-job training. A manager without effective communication skills can have a detrimental effect on their staff. This is often evident when employees say that they feel they do not receive adequate instruction or direction. This can also result in people receiving conflicting information which can result in confused or frustrated employees. By developing both written and verbal communication skills a manager will be able to convey information accurately and confidently to their employees. This will make the employees feel that they are well-informed and receiving adequate direction. 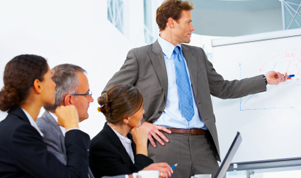 Delegation is another key skill that managers can utilize to create a satisfied work force. When a manager is able to properly delegate appropriate tasks to subordinates, the employees will feel that they are being challenged professionally and more involved in the work of the organization. This also allows the manager additional time to focus on other pressing manners. When delegation is done incorrectly, it can create a sense of failure if the employees are given tasks they are unqualified to complete and ineffectiveness when rework is later required. As most managers can attest, conflict resolution is a very valuable skill. During the course of any day, managers will need to resolve conflicts between a variety of individuals. The ability to reach a mutual understanding between the conflicting parties will result in happier employees. If a manager is perceived as taking sides or arbitrarily selecting a solution, all involved will feel like they have lost. A delicate negotiation and open communication can allow a manager to reach a solution that will yield the greatest benefit for the employees and the company. Finally, coaching is an absolutely required skill for any successful manager. An effective coach will create a positive working environment which leads to higher retention rates. A coach will work with employees as groups or individuals to determine their goals within the organization and create plans to achieve those goals. When acting as a coach, a manager can provide candid and constructive feedback to develop weak points of employees and also give praise for strengths and accomplishments. If employees feel that their direct supervisor does not care about their success, they will be more motivated to find other employment. A manager that is involved and invested in the success of their subordinates will create a pleasing work environment and also more satisfied employees.